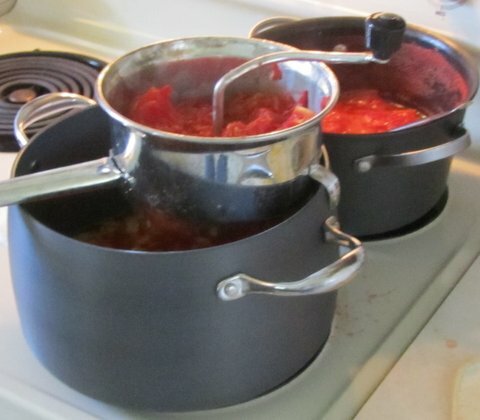 Not many gardeners and cooks have the time or patience to make tomato sauce the traditional way—which can take nearly a day if you include the time setting up, preparing the tomatoes for cooking, cooking, canning or freezing, and cleaning up. So over the years I’ve read scores of recipes looking for shortcuts that result in time saved but still sauce that’s better than opening a store-bought jar or can. I’ve mentally pieced together “my” sauce recipe, but since I’ve never written it down and am not the measuring kind, each batch of sauce is a bit different. Today I made my first batch of sauce of 2012. We—Ellen and I and our visiting son and family of 5—have been eating lots of tomatoes and giving away many. But this is mid-August and the number of tomatoes on our garage counter increases every day. This morning I checked and found that I had to make sauce or many of the tomatoes soon would have to be discarded. How do I make sauce? 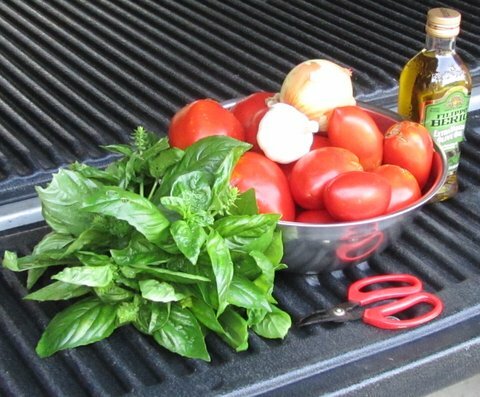 I use the obvious—tomatoes—plus onion, garlic, olive oil, and basil, plus some seasonings, usually salt, pepper, and sometimes crushed red pepper. I’m the kind of cook that uses some of this, a bit of that, and pinch of that and leave the scales and measuring cups and spoons in their storage places. 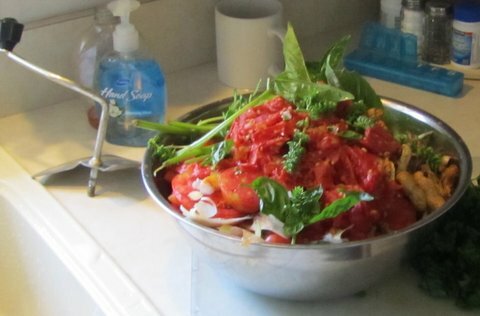 For this batch I started with a colander and a half—I’d guess six pounds—of Amish Paste and Celebrity tomatoes, a large onion, a half dozen cloves of garlic, a few gurgles of olive oil, a large bouquet of basil fresh-cut from our garden, plus the seasoning. To save time, I don’t cook and stir the sauce for two, three, or more hours. I don’t blanch the tomatoes and skin and core them. Instead, I cut off any bad spots and cut the tomatoes in chunks into Pot 1, the first of two pots. I then cook the tomatoes for 20 minutes or so, until large chunks begin to soften and small pieces begin to disintegrate. While the tomatoes are cooking in Pot 1, I chop onion and garlic into Pot 2, add olive oil and seasoning, and let cook for a few minutes. 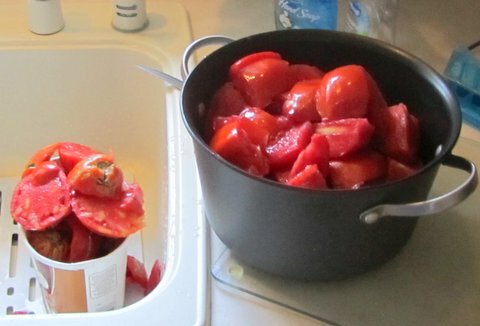 Then I ladle or spoon the partially cooked tomatoes into a food mill positioned over Pot 2 and run the tomatoes into Pot 2, leaving skins, hard cores, and most seeds in the mill. Then I simmer all the sauce ingredients for about 45 minutes in Pot 2 and add chopped basil for the last five minutes. Ah, the fragrance of it all. Can’t you all but smell the aroma? The project usually takes two and a half hours or so, including most cleanup. When I’m happy with the sauce, I let it cool in the pot. Since we’ll be using today’s sauce this weekend, I stored and refrigerated two quarts and we made spaghetti for lunch to use most of the two cups left over. If I make another batch in a week or so, I’ll freeze it in plastic containers or bags for wintertime enjoyment. Let it snow, let it snow, let it snow. Isn’t my sauce on the “thin” side? Yes. 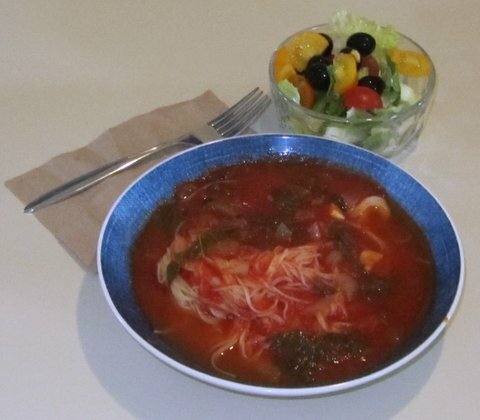 When you search online recipes, you’ll see that many “quick” sauce recipes mention they result in “thin” or “light” sauces, even if you use paste-type tomatoes, such as the Amish Paste variety I used. We’re not offended by “thin” sauce, but if we want it thicker, we add a can of tomato paste when we prepare it for serving. If you get sauce-making fever, check out recipes online. You’ll find hundreds if not thousands. Choose two or three that look interesting and use them as guides to create your own personal recipe. And don’t forget the cleanup. When I look at the smudged stovetop, the used pots and other utensils, and the trimmings and other throwaways, I marvel how TV programs and magazine articles show how to make great recipes without even a nod to end-of-project cleanup. Couldn’t they just once give us “10 Tips for Cleaning Up Your Kitchen Mess”? Good looking picture of a bowl of organic material for the compost bin. Yes, mid-August is the sauce making time of year. The way my tomatoes are producing, I'm making sauce every week and sometimes twice a week. It's a great winter meal and the grandchildren just love it. I cook the tomatoes, run them through the food mill, then freeze the puree. Save the sauce-making for cooler weather, when a little extra heat in the kitchen is appreciated. Love the pictures and the description, Bob. I'm in awe of people who can cook with one hand and remember to photo the project with the other! I'm usually waaay to messy.